The Learning Registry looks to crack the education resource discovery problem. Education innovation will require scalable, national, open, interoperable systems that support data feedback loops. At the recent State Education Technology Director’s Association’s (SETDA) Leadership Summit, the United States Department of Education launched the Learning Registry, a powerful step toward creating the ecosystem infrastructure that will enable such systems. 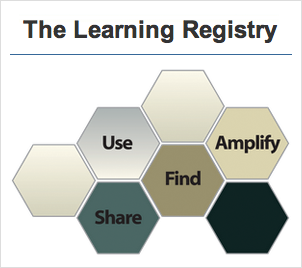 The Learning Registry addresses the problem of discoverability of education resources. There are countless repositories of fantastic educational content, from user-generated and curated sites to Open Education Resources to private sector publisher sites. Yet, with all this high-quality content available to teachers, it is still nearly impossible to find content to use with a particular lesson plan for a particular grade aligned to particular standards. Regrettably, it is often easier for a teacher to develop his own content than to find just the right thing on the Internet. Schools, states, individuals, and professional communities have historically addressed this challenge by curating lists of content; rating and reviewing sites; and sharing their finds via websites, Twitter and other social media platforms. With aggregated sites to peruse, a teacher might increase his odds of finding that “just right” content, but it is still often a losing proposition. As an alternative, most educators will resort to Google, but as Secretary of Education Arne Duncan told the SETDA members, “Today’s search engines do many things well, but they aren’t designed to directly support teaching and learning. The Learning Registry aims to fix this problem.” Aneesh Chopra, United States CTO, called the project the flagship open-government initiative for the Department of Education. The Department of Education and the Department of Defense set out to solve the problem of discoverability, each contributing $1.3 million to the registry project. Steve Midgley, Deputy Director for the Office of Educational Technology pointed out, “We didn’t build another portal — that would not be the proper role of the federal government.” Instead, the proper role as Midgley envisioned it was to create infrastructure that would enable all stakeholders to share valuable information and resources in a non-centralized, open way. In short, the Learning Registry has created open application programming interfaces (APIs) that allow publishers and others to quickly publish metadata and paradata about their content. For instance, the Smithsonian could assert digitally that a certain piece of video is intended for ages 5-7 in natural science, aligned with specific state standards. Software developers could include algorithms in lesson-planning software systems that extract, sign, and send information, such as: “A third grade teacher used this video in a lesson plan on the bridges of Portland.” Browser developers could write code to include this data in search results and to increase result relevance based on ratings and reputations from trusted sources. In fact, Midgley showed the SETDA audience a prototype browser plug-in that did just that. The virtue of this system comes from the platform thinking behind its design — an open communication system versus a portal — and from the value it provides to users from the very beginning. In the early days, improved discoverability of relevant content is a boon to both the teacher who discovers it and the content owner who publishes it. The APIs are structured in such a way that well-implemented code will collect valuable information about how the content is used as a side effect of educators, parents, and others simply doing their daily work. Over time, a body of metadata and paradata will emerge that identifies educational content; detailed data about how it has been used and interacted with; as well as rating, reputation and other information that can feed interesting new analytics, visualizations, and meaningful presentation of information to teachers, parents, researchers, administrators and developers. Midgley called for innovative developers and entrepreneurs to take advantage of this enabling system for data collection in the education market. As the simple uses begin to drive use cases that shed increasingly rich data, there will be new opportunities to build businesses based on analytics and the meaningful presentation of rich new data to teachers, parents, students, and others who have an interest in teaching and learning.